?They had a date with fate in Casablanca!? These handmade dangling crystal bead earrings resemble Moroccan lanterns. 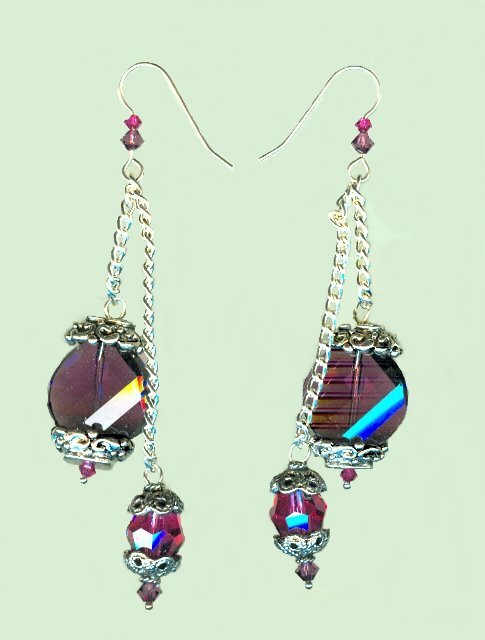 They're made of amethyst and fuchsia Swarovski crystals. 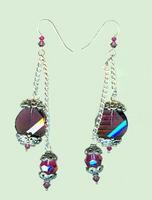 The crystal bead earrings also feature silver plated decorative bead caps, and silver plated chain. The longer pendant drops about 3-1/2" from the top of its crystal embellished sterling silver French hook. There is no way to avoid being noticed by the dashing gentleman near the piano when wearing these striking bead earrings. Expect the unexpected when you wear crystal bead earrings from SPARKLE PLENTY.